The novice adventure race training program is intended to prepare those with little or no adventure racing experience for their first sprint length adventure race! The summer season runs from May through July. Participants are expected to have little or no knowledge of adventure racing. Since novices stand to learn the most from adventure racers, the program is led by a group of coaches who are experienced adventure racers. There are separate coaches for each discipline, and each has a strong background in the sport they will be coaching. Check out the coaches page for more information. Practice will be held every Monday and Wednesday at 6:30 pm, as well as every other Saturday morning, with some exceptions. Weekday practices will be dedicated to one of the core disciplines of adventure racing: running, biking, paddling or navigation. Weekend practices are intended to add even more variety to the program and may include exposure to some of the fringe disciplines of adventure racing (such as rollerblading, scootering, climbing and ropes work and mystery events). As the schedule advances, participants may expect to participate in a variety of disciplines at practice. For all practices, the discipline of emphasis as well as any required gear will be listed on the website training calendar. If all this sounds interesting, exciting or maybe even a little scary, we encourage you to contact us at Organizer@TXARClub.com or 832-713-8927. We're sure after you get your questions answered, you'll want to sign up and participate in the exciting sport of adventure racing. We think you will find adventure racing to be a fun and exciting way to get in shape and add some variety and adventure to your life! 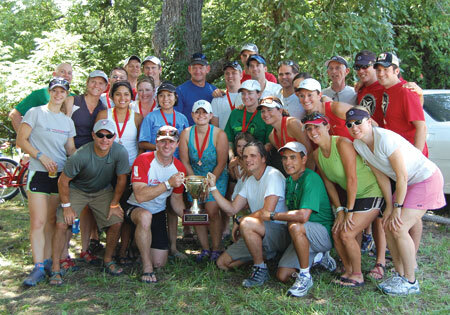 Terra Firma's Texas State Championship Sprint Adventure Race Series!